Awkwardly googles "who is Marie Kondo?". 1. 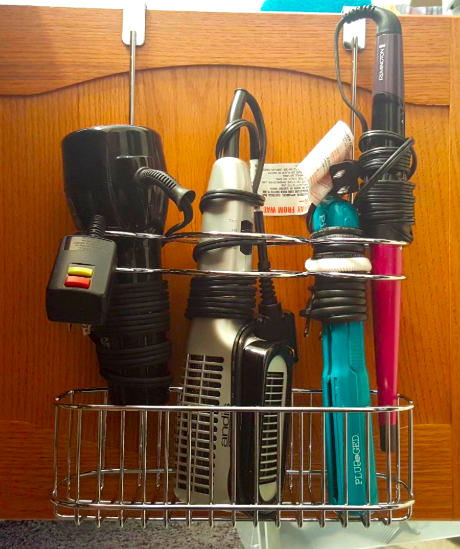 An over-the-door cabinet organizer for improving your bathroom's vanity and, more importantly, being able to locate your hair dryer. 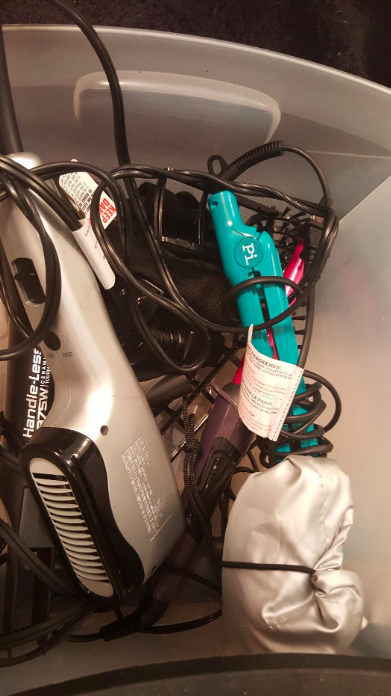 Turns out you can be on time to work when you know where your heat stylers live. Get it from Amazon for $15.99+ (available in seven colors). 2. A set of vacuum storage bags, because if you really can't get rid of that 2009 clutter you can at least minimize it. 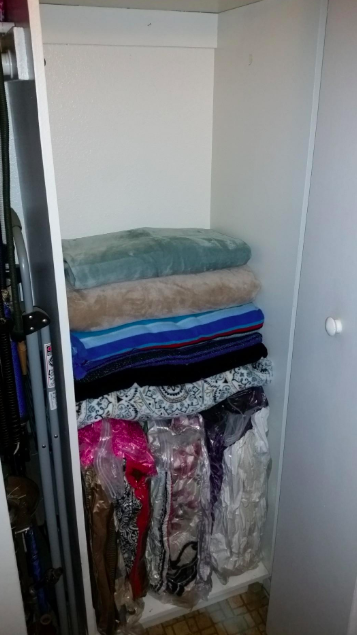 Behold: actual room in your linen closet! Get a pack of six from Amazon for $29.99. 3. 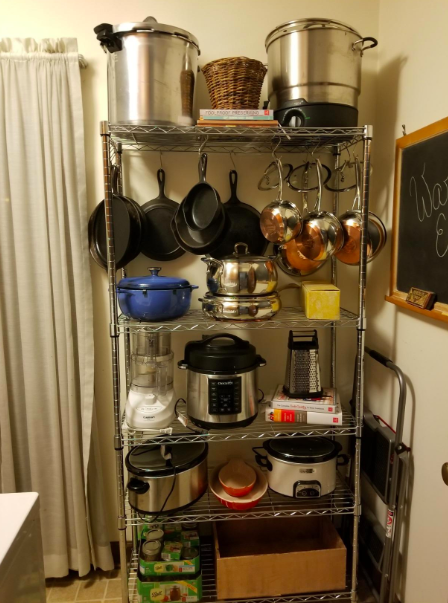 A two-tier expandable rack that'll quickly organize anything from kitchen pots to bathroom towels so you never have to go digging for them again. Promising review: "It looks great on my kitchen counter. 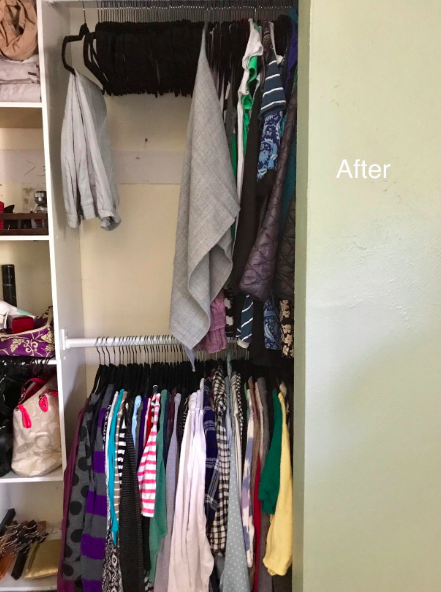 I finally got rid of a basket that didn't quite hold everything. The shelf is very sturdy." —Ennea L.
Get it from Amazon for $26.99+ (available in two colors). 4. 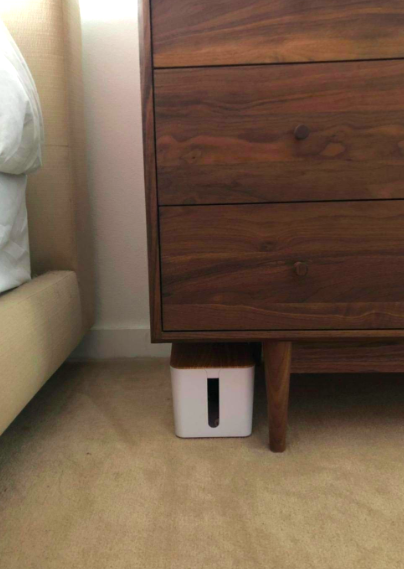 A cable cord box so you can easily hide unsightly tangled messes with minimal effort. Meaning: "out of sight, out of mind" totally applies to this. 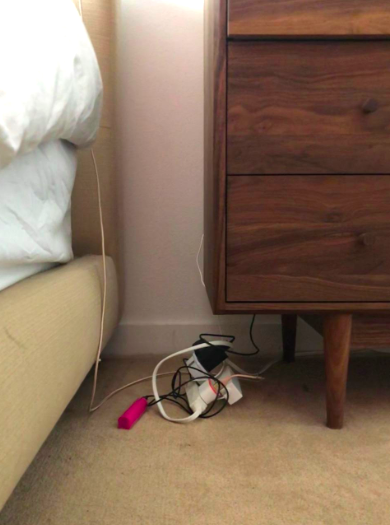 Promising review: "I can't wait for the time when cables no longer exist in an absolutely cordless world. Until then, this cool little box does a good job of hiding my cable mess. It's big enough to store extra battery packs and chargers, too." —Jenny K.
5. 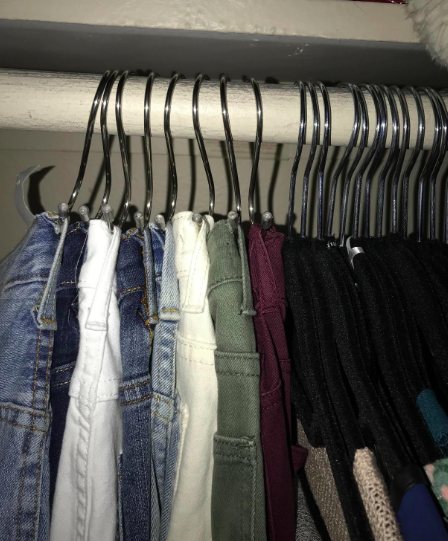 A set of stainless steel curved hooks for instantly creating more space in your closet, counters, pantries, WHEREVER, by hanging up previous clutter. So long, clattering pots. Get a pack of 20 from Amazon for $6.87. 6. An over-the-door hamper, because throwing your laundry everywhere has got to STOP. This won't even take up floor space — you have zero excuses left. It comes with two stainless steel hooks! Get it from Amazon for $19.95 (available in four colors). 7. 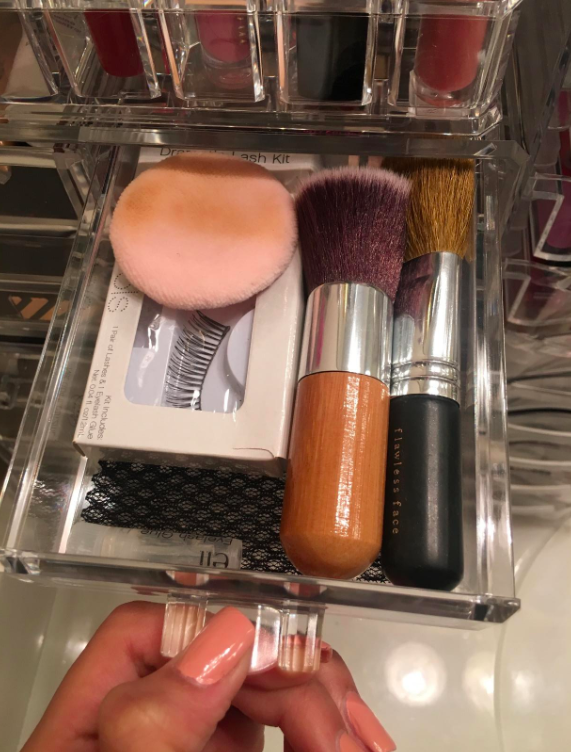 An acrylic cosmetic organizer that'll keep your 10,000 makeup brushes and mascaras from taking over the bathroom. 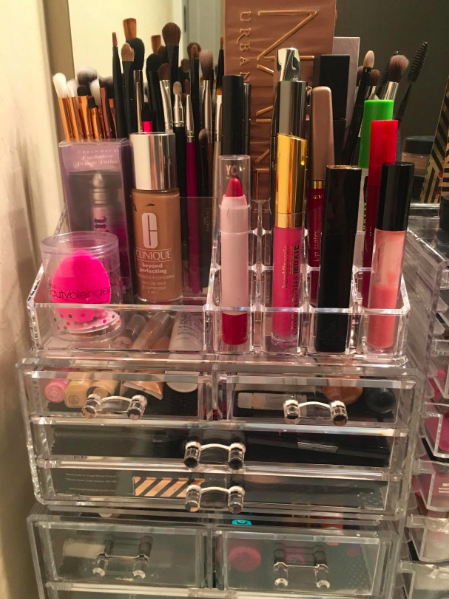 It has drawers and compartments galore to fit even the biggest lipstick collector's stash. 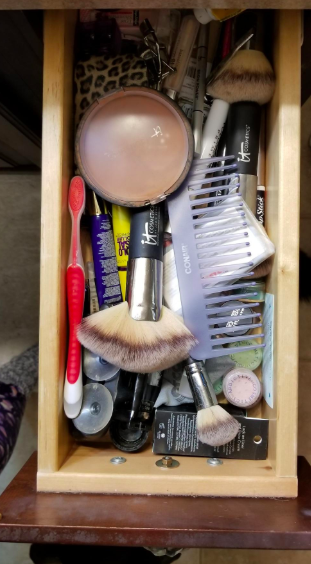 It comes as a two-piece set with four drawers, 12 lipstick slots, and one shelf so you can fit e-v-e-r-y-t-h-i-n-g. Plus, it comes with mesh padding for the drawers so everything stays in place! 8. An iron corner clothing bar so even if you got stuck with the room that doesn't have a closet (hello, NYC apartments), you don't need to keep your clothes in a pile. There are better ways, I promise. 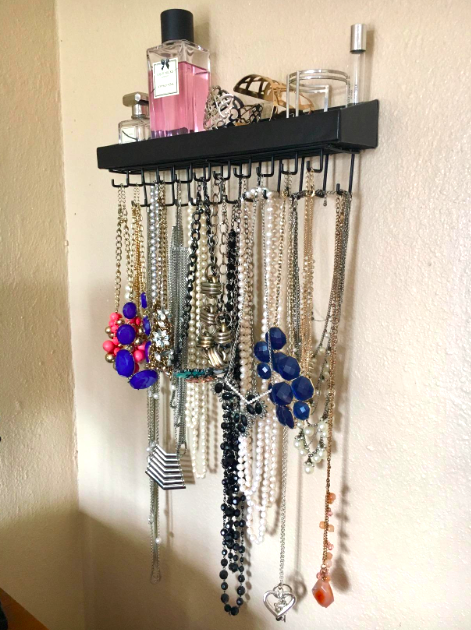 It comes with everything you need to hang it! 9. 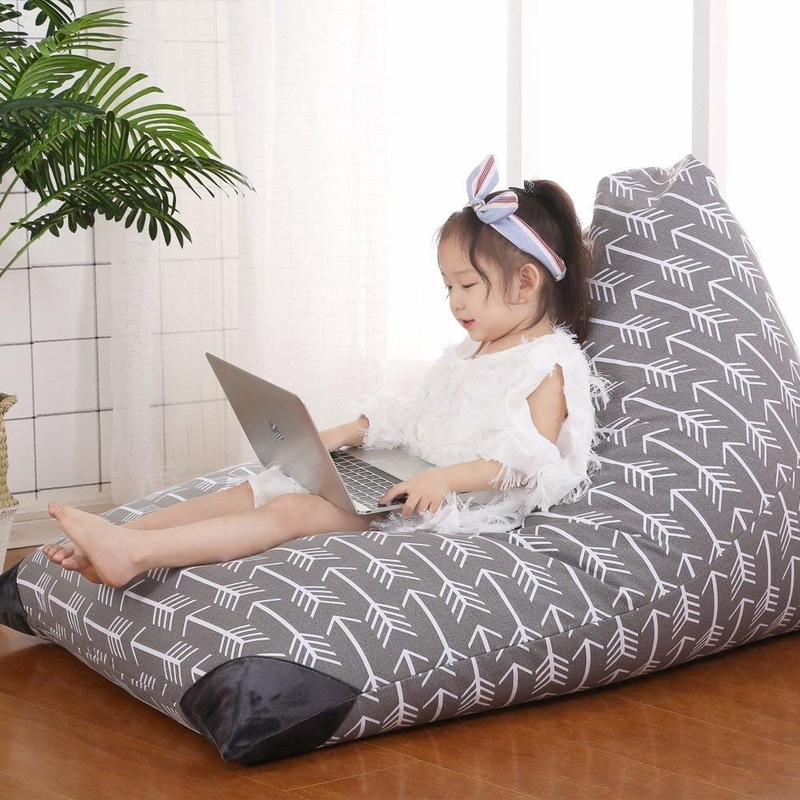 A storage bag bean chair for a clever way to a) encourage your kids to clean up after themselves and b) avoid living amongst piles and piles of toys. 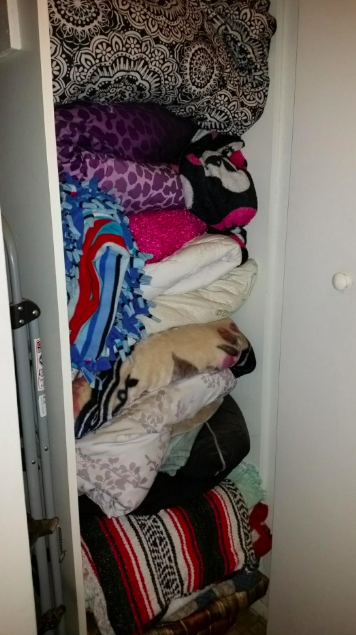 Adults use this for storage, too! Get it from Amazon for $19.99+ (available in two sizes and 12 colors). 10. 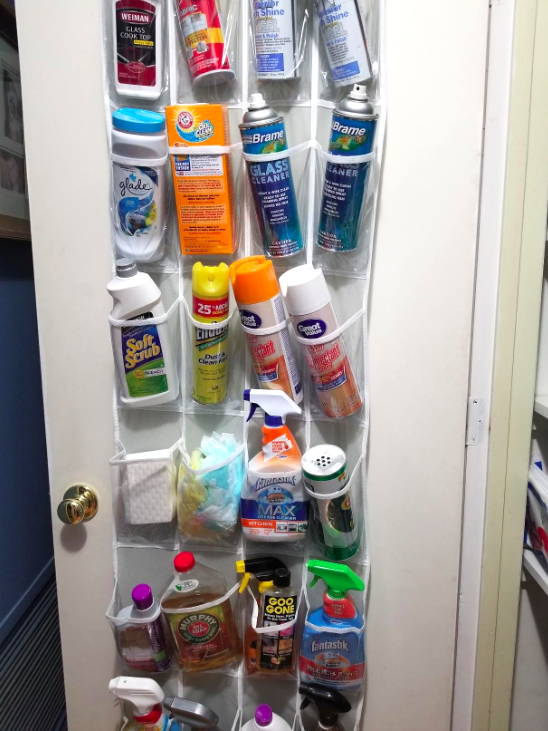 An over-the-door shoe organizer, because this'll make it easy to put anything from shoes to cleaning supplies (you have those right?) in a proper place and out of your way. 11. A magnetic key holder that'll never let you lose the most important thing of the day again. As some of us know all too well, calling the locksmith is EXPENSIVE. Not to mention, unless we have this we're just going to lose our keys all over again within the week. 12. 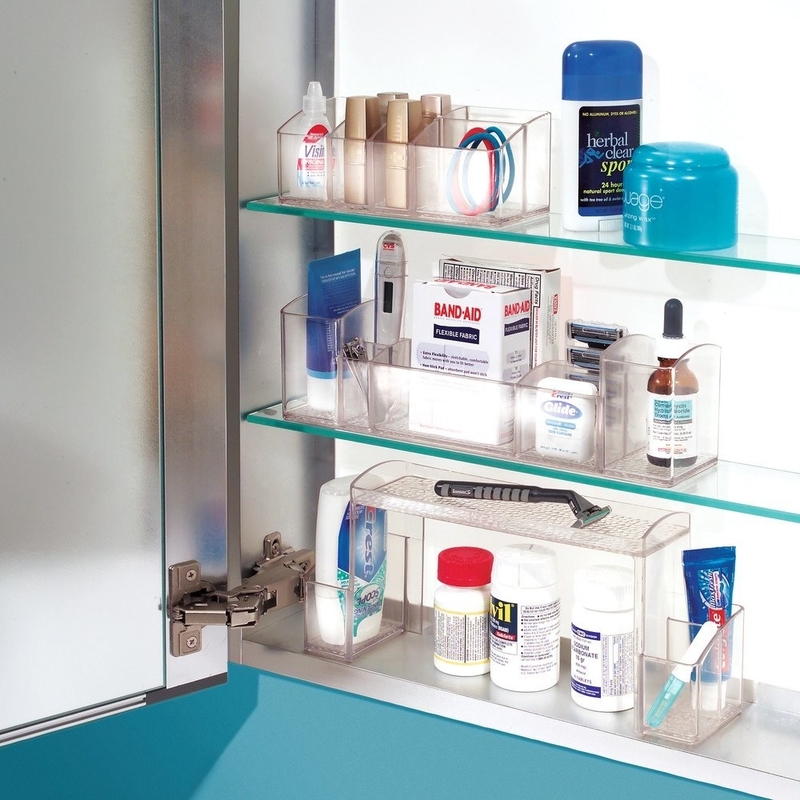 A medicine cabinet organizing bin so your deodorant doesn't get buried by your 3,000 hair styling products. Some reviewers even hang this up to create more shelf space! Get it from Amazon for $7.99+ (available in three sizes). 13. 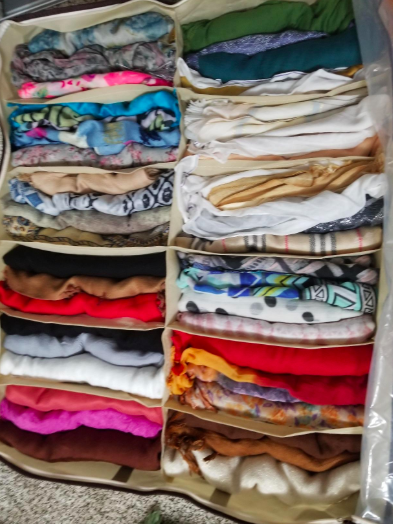 A duo of expandable drawer dividers for separating your bras from your underwear, instead of desperately tearing your entire dresser apart every morning for that *one* bralette. Don't act like you don't know what I'm talking about. Get a pack of two from Amazon for $19.99. 14. 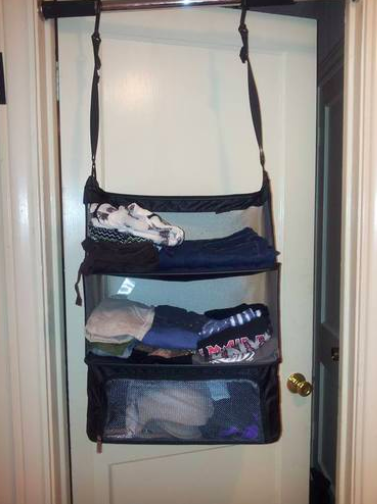 A packing organizer, because this will make *un*packing your suitcase whenever you travel an actual reality. 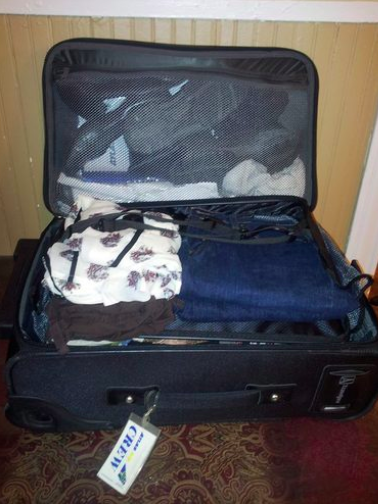 The days of living with clothes spilling out of a suitcase in the middle of your room are officially over. Get it from Amazon for $31.98. 15. A toilet paper stacker that'll de-clutter your linen closet or wherever you've been creating precarious toilet paper towers. Side note: you'll never be, ahem, ~abandoned~ again. 16. 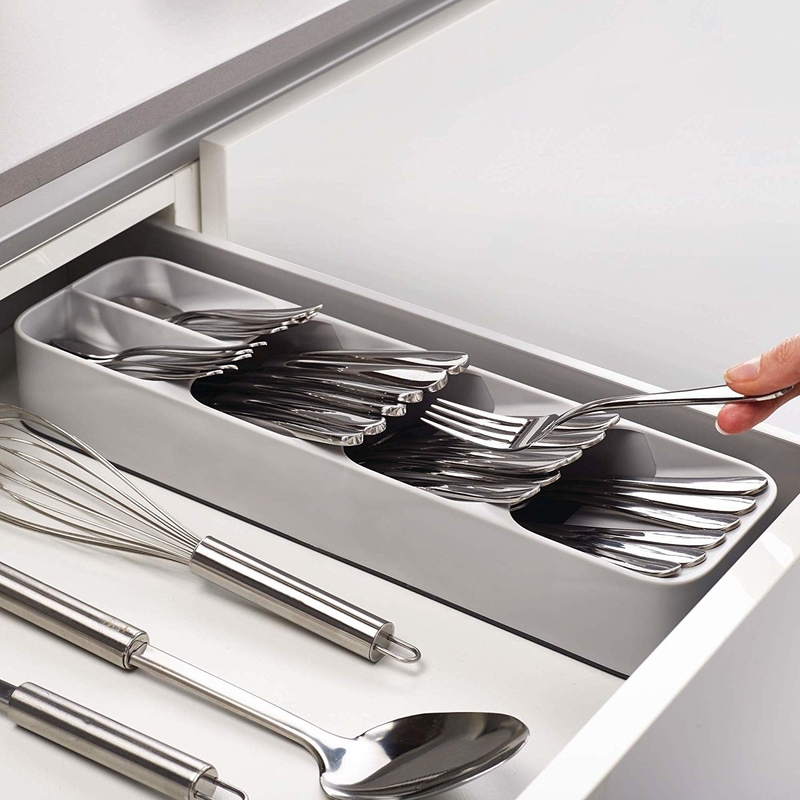 A cutlery organizing tray so you can still essentially toss your forks into the drawer (this design definitely allows careless placing), but now they'll all stay together. Promising review: "Seriously, this is the best invention ever. My poor utensil drawer was stuffed to the seams and this little guy totally solved the problem. 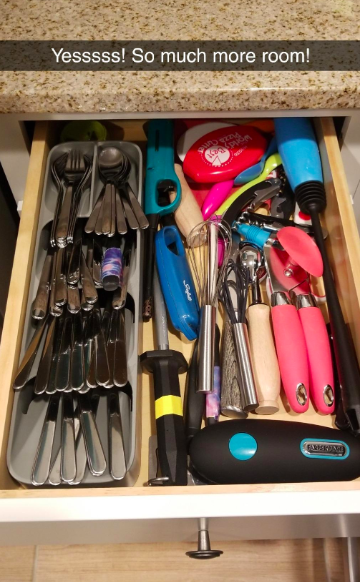 We use flat IKEA utensils and can fit 12 of each piece. 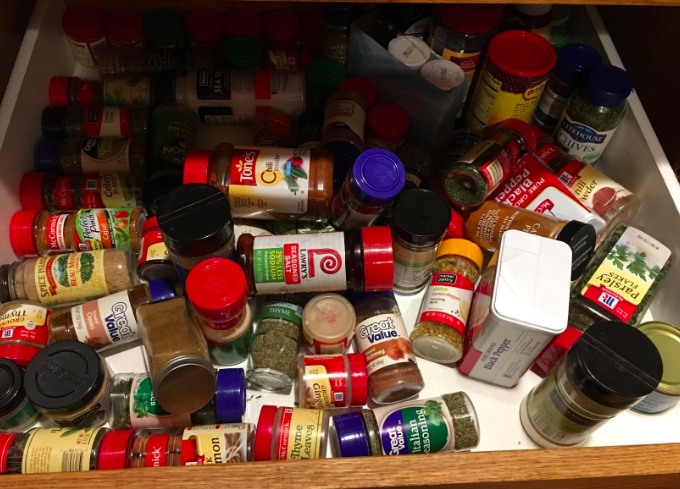 I can't explain how happy I am to have so much room in that drawer now. And for less than $10!" —Brittany H.
Get it from Amazon for $9.99+ (available in three styles). 17. 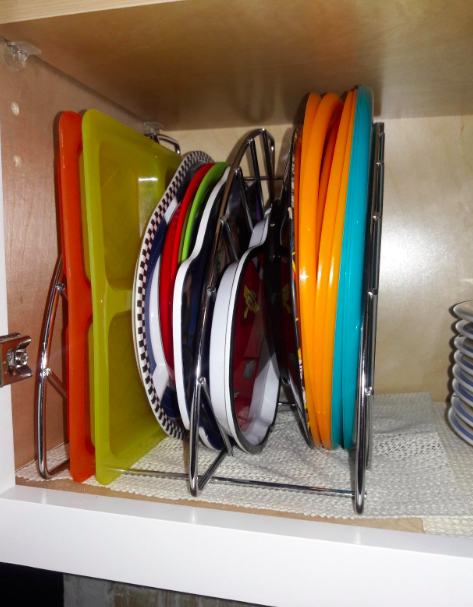 A three-tier shelf organizer for stacking your dishes, pots and pans, or even cutting boards safely and without the risk of breaking. 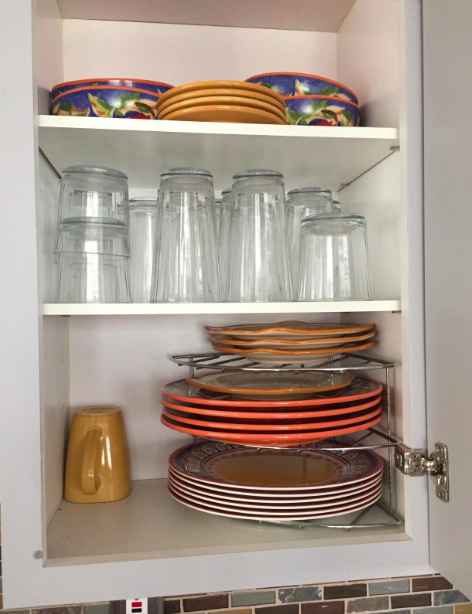 Repeat after me: I will stop trying to balance all my dishes into one pile. 18. A shower curtain with nine mesh pockets, because you and I both know how many empty shampoo bottles are currently living in your tub. It's time to let go. 19. 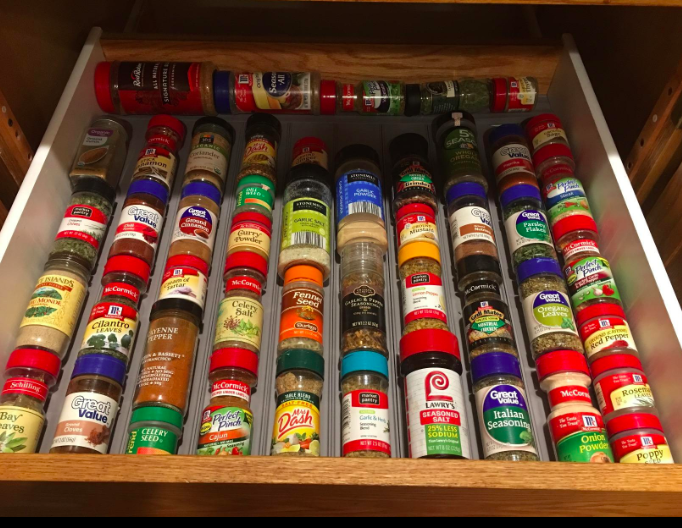 A spice jar drawer liner that'll make your fancy herbs look less like a junk drawer and more like an audition to cook with Ina Garten. Today is the day you learn recipes don't actually call for desperate search parties to find the oregano. Get a pack of six from Amazon for $12.99. 20. A recycle sorter so a) you earn bragging rights for saving the planet and b) you stop putting all your plastic bottles at the door just to throw in the garbage, anyway. How embarrassing. Your landlord knows it's you. 21. 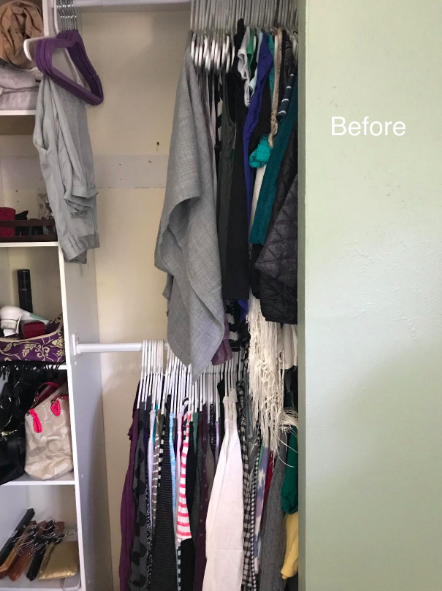 A set of non-slip velvet hangers for easily making your closet look put together, as well as keeping all your clothes off the floor. Oh...there's that silk top....from 2015. Get a 30-pack from Amazon for $17.99. 22. 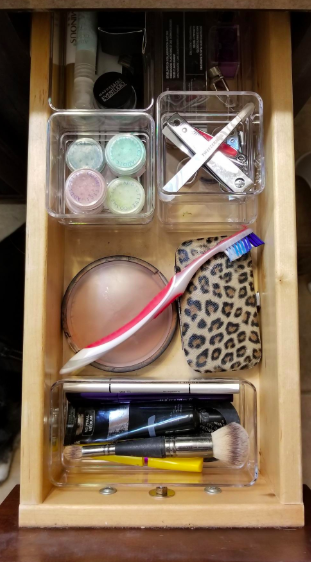 A set of plastic drawer organizers, because these'll declutter your bathroom, desk, vanity, really whatever needs the most help. Living in a grownup house = knowing where your toothbrush is. Get a pack of six from Amazon for $14.99. 23. A cotton storage basket that'll still allow you to toss clothes, laundry, whatever away carelessly, but now they WON'T stare you in the face for the next three weeks. Tl;dr: this'll replace The Chair. 24. A set of drawer organizing baskets so you can separate all your essentials and keep them in their rightful place. Why, you ask? 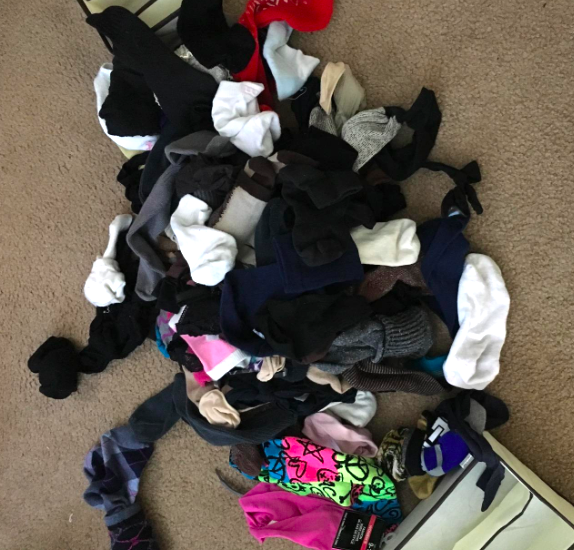 How many times have you run late because you can't find any bleeping socks? You have your answer. 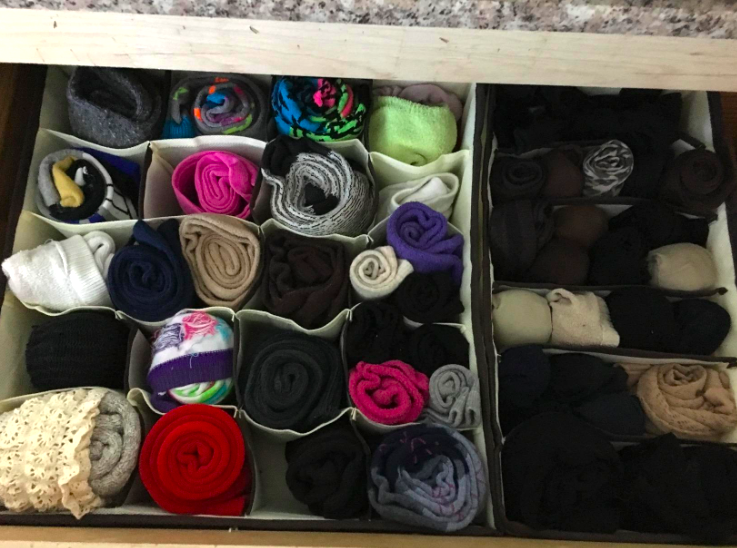 It comes with four bins: a five-cell bin for bras, a six-cell bin for dressers, underwear, scarves, ties, an eight-cell bin for briefs, and ties, and a 20-cell bin for socks. Get a pack of four from Amazon for $15.99. Get a set of six from Amazon for $19.99 (available in 13 colors). 26. A desktop monitor organizer, because this'll both clean up your usual clutter to help you FINALLY focus *and* make your home office look like a more motivating place to work. Get it from Amazon for $17.99 (available in two colors). 27. 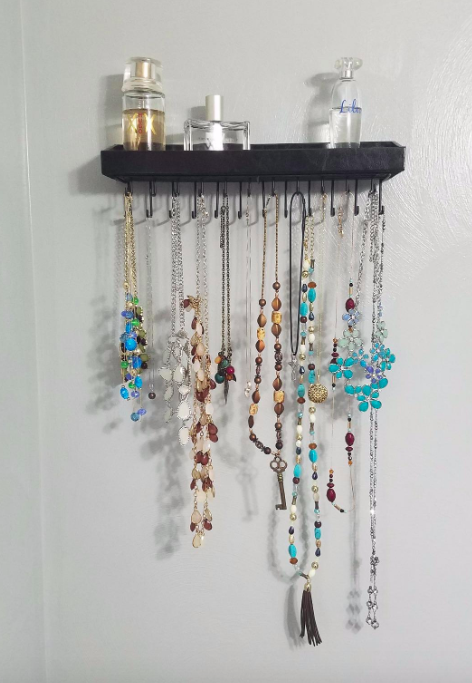 A wall mount jewelry tree that'll keep your necklaces untangled for you — I'm sorry, but you can't be trusted. AND it doubles as extra storage for perfumes, candles, whatever! 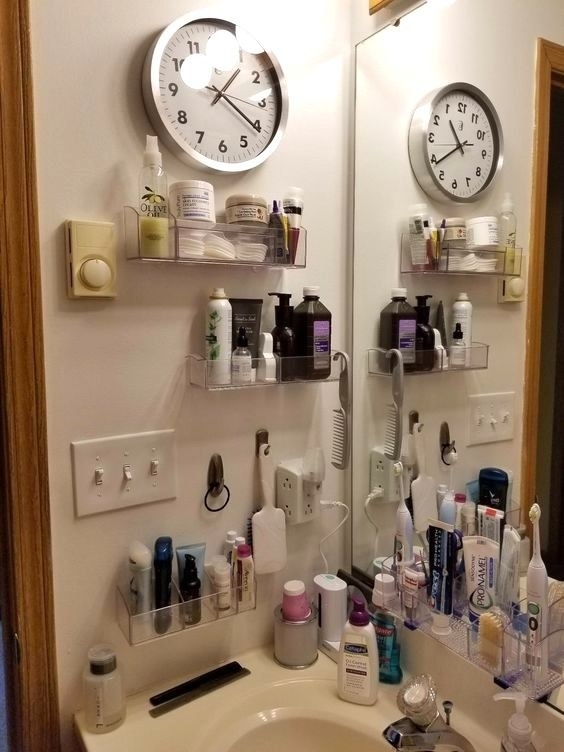 Everything you need as a last step when getting ready is right at your fingertips. When was the last time that happened? Never? Same. Get it from Amazon for $17.90+ (available in five colors). 28. 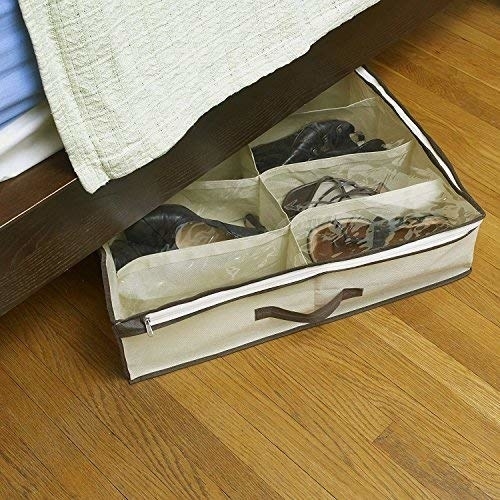 A storage ottoman so you technically don't have to clean your whole house, but all those random things taking over your living room will quickly "disappear". It can even fold if you want to put it away, as well as double as a padded top for extra seating! Get it from Amazon for $18.99 (available in six colors). 29. 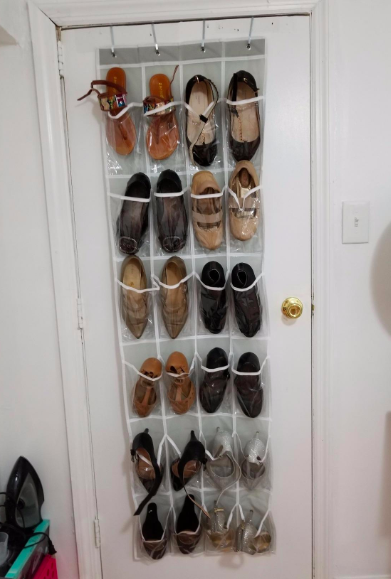 A shoe organizer great for anything from boots to unused sweaters — cleaning up your space may seem intimidating, but now you can use every procrastinator's go-to tactic: hiding it all under the bed. It has 12 slots! Reviewers use this for shoes, scarves, sweaters, you name it.